And with that, LordBritish contacted CMDR Alpha Station and had me thrown out of that squadron too. CMDR Alpha apparently wasn’t interested in hearing anything from me on the subject of what got LordBritish so riled since it was he and CMDR Farmere who, last night, had apparently become telepathic and started suddenly dictating what I was thinking about them and myself. Add to this suddenly revamping what I said and perverting it into something I hadn’t said at all – when I asked permission to record the conversation for later playback, they both refused without saying why. I was only interested in a record to ensure accuracy for the 3 of us to go back to. Perhaps they thought I had other motives? Seeing I wasn’t welcome any longer and finding no way to resolve their apparent deep-seated issues with me (which had been festering for a while I’m now told) they came onto my discord.gg channel and posted the above. 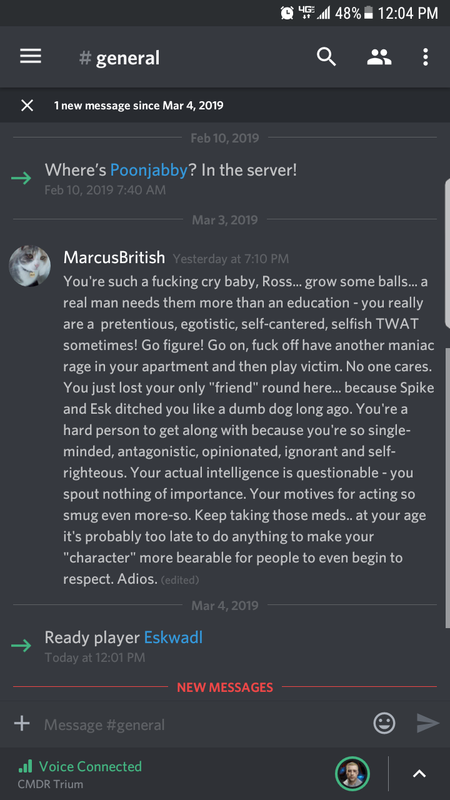 When I left the LordBritish server, I had not intented to return and was on to minding my own business desiring neither further discourse with Farmere or Marcus (LordBritish). So why the fresh campaign of slander, lies and insults? Because I’d blocked both of them to concentrate on my own business I didn’t see the above text right away and it was left there probably too long. To those who caught it, this is apparently what it was all about — my decision to depart without accepting their re-imagined view of the conversation (and it was completely re-imagined). What had started as a silly argument about the facts of my education from a pair of game players who take themselves a little too seriously ended up perverted into something it never was in the real version. Apparently, they felt because there were two of them agreeing to some new version of what I’d said somehow that made it true. Excusing the hypocrisy at their accusations of “pretentiousness” is one thing. But clearly, they’re not leaving this alone so I offer the above explanation in hopes it (and they) will all just go away. I know what I said and how I said it. Just because there are 2 of you doesn’t mean you can edit the conversation to your preferred version and stick it on me. Tell the whole world your version if you like — mine is still the correct one and if it wasn’t you wouldn’t have been afraid of recording further conversation for the sake of reference. I will add here I can’t stand people who talk behind each others’ backs maliciously and this coupled with the trolling mentality I’ve started to endure is surely a clue even to these people — enough’s enough! Obviously, I erred here: I shouldn’t ever have wasted the time getting to know you 2. I can’t get that time back, but I can ask you not to waste any more of my time with your lack of ability to cope with this disagreement. Let’s just go our separate ways. OK? oor Don Martin. CTV’s host of Power Play spent his “Last Word” (if only!) decrying Justin Trudeau apologizing 5 times during his government’s term in office thus far, with a 6th apology for our nation returning Holocaust-fleeing Jews back to the Nazis during World War II. It’s just too often, says Martin, and too well politically-timed not to be suspect. The apologies Trudeau has given on our nation’s behalf serve a purpose. We could follow Martin’s suggestion and say nothing to redress historical wrongdoings — the practice of Canadian governments for decades. Perhaps nobody alive today had the experience of suffering the injustices and outright atrocities being apologized for. But it does serve the purpose of those who are alive and still bearing the scars of such actions years later perhaps due to indirect associations of one form or another to have the Government of all Canadians (not just Liberals like Trudeau, but Conservatives like Marin too) recognize an injustice done to people and apologize. This doesn’t somehow express the guilt and remorse of Canadians today, but it does express the guilt and remorse of the Government — even if it’s presumed that nothing of this sort could ever happen again. Rest assured, Mr. Martin, the Government of Canada still has acts which it has to apologize for and will well into this century at the very least (perhaps with or even without the knowledge of our Prime Minister). Human beings, so error-prone as we are; so flawed in our ability to exercise mature judgment at the best of times, are forced to learn from mistakes made. And this Government isn’t perfect, as you rightly point out. But it is Canadian. It is our government. And sometimes an apology is the proper course; however frequent it may seem to you. Perhaps you’ll join your fellow Canadians in offering an apology or two someday. If not for any errors in judgment you might have had, at the very least for holding a Government’s honest efforts to provide those who feel injustice some kind of recognition for their emotional traumas. Unless of course, you believe that a television camera or very big microphone renders you incapable of error or immune from the need to offer a simple apology.